Contact Sheila for interviews and speaking availability. 19 November 2016: Keynote Speaker for the Stars Behind the Stripes Dinner & Dance honoring spouses and partners of US service members. Aspire Magazine features my work under the Wisdom & Self Growth tab. “Guarantee a Life of Ease and Flow with this One Action” Women everywhere struggle to take care of everyone but themselves. Discover the one action you can take to guarantee a transformational life shift making room for less tree and more ease and flow — and joy! “Negotiating a Job Change? Ask Yourself this Question First” As women, negotiating a job change can feel challenging. Identifying whether your request is based on a need or a want will help you best position the conversation so you get the outcome you desire. “The Power of Daydreaming to Connect to Your Joy” Here’s how daydreaming allows you to connect with your desired future experience. Plus, five tips for leveraging your day dreams! “3 Easy Tips for Staying Focused on the Good” A positive outlook makes all the difference. This is a great list for kids, too! “Top 10 How-to List for Claiming Happiness Now” We all want to be happy, so why wait? “Participate Boldly in Evolution of Your Life” Participating bolding in the evolution of your life means you must truly desire the very manifestation you wish to create. Here’s how to make it happen. “Three Easy Steps for Putting Self-Care First.” As women, we tend to put everyone first. If that statement resonates, you’ll want to read this one! “20 Affirmations for Letting Go and Moving Forward” for when you’re feeling stuck! Listen to my interview with Linda Joy, publisher of Inspired Living Publishing. We talk about recovering from Super Woman syndrome and the power of laughter. Listen in now! Transition can be challenging. In this interview with Linda, we talk about the challenges of change as I talk about the initial resistance I had regarding a relocation from North Carolina to Texas. Listen in now! 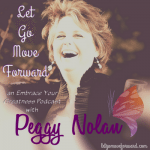 Listen to my interview with Peggy Nolan, the vanquisher of fear and doubt, and facilitator for making peace with your pieces! In this interview, I talk about letting go of old beliefs, especially cultural and familial influences imprinted in my childhood, in order to find a deep and meaningful spiritual filled life. Listen in now!